The newly restored RASHOMON (1950, d. Akira Kurosawa) had its world premiere at the Academy of Motion Picture Arts and Sciences’ Samuel Goldwyn Theater on Thursday, September 18th. The evening kicked off a series of Kurosawa screenings and the opening of the art exhibit “Akira Kurosawa: Film Artist,” featuring drawings and paintings by Kurosawa, in the Galleries of the Goldwyn’s Grand Lobby and Fourth Floor. Following a reception in the Grand Lobby, Academy President Sid Ganis welcomed the audience and introduced the evening’s host, film critic Kenneth Turan. 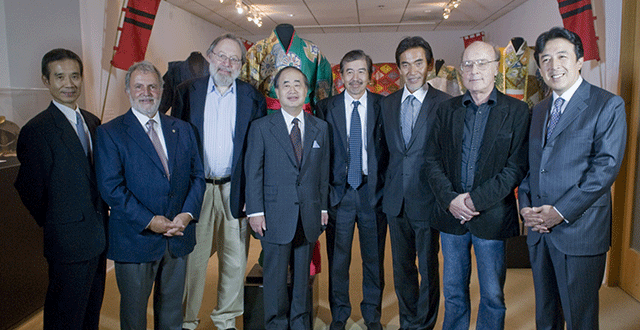 After entertaining the audience with little-known facts about RASHOMON, Turan moderated a panel discussion with Kurosawa’s son, Hisao Kurosawa, RASHOMON star Toshiro Mifune’s son, Shiro Mifune, and American film producer Tom Luddy, who was instrumental in Zoetrope’s support for Akira Kurosawa’s KAGEMUSHA (1980). The beautifully restored film was then screened. The film was restored by the Academy Film Archive, in association with the Kadokawa Culture Promotion Foundation and The Film Foundation. The basis for the restoration of RASHOMON was a 35mm black-and-white print made in 1962 from the original camera negative and placed in the collection of the National Film Center in Tokyo. While the print itself was in good physical condition, the source material from which it was made was already extremely battered due to the extensive printing and handling it had received over the course of its life. Many shots were already starting to shrink and warp, and there were numerous scratches and abrasions, dust, dirt, and other artifacts from the damaged negative which were photographed into the print. That print was scanned at 4k resolution at Lowry Digital in Burbank, CA. The original scans were converted to 2k files for extensive image processing and clean-up by the artists and technicians at Lowry. While some of the damage could be addressed by Lowry’s automated software, many frames needed to be meticulously cleaned by hand. Unique problems such as the warping in some shots and the blurring of every 2nd frame throughout the film were addressed with customized visual effects tools. Once image restoration was complete, two 4k digital intermediate 35mm negatives were produced, as well as a complete digital archive of both the raw scan and the restored image files. On the audio side, the 1962 print and a fine grain master positive in the Kadokawa Foundation’s collection were transferred at DJ Audio. Audio Mechanics was responsible for identifying the best source element for each shot in the film and using these to create a seamless soundtrack. The presentation at the Academy will be utilizing a 2k Digital Cinema Package file.